A Malaysian newspaper recently carried an article about a Spiritual Master who is able to take participants on a tour to heavenly realms and meet deities and deceased loved ones….for a fee. Assuming that the Spiritual Master is able to do that, would you try it? And if he was able to show you these heavenly realms, would you take him as your Guru? The most important question is; would his teachings be consistent with what you truly want? The desire for spiritual powers or Siddhis is a common obstacle among spiritual seekers. It is an obstacle that can cause us to divert from our path thus stalling our progress towards self-realisation. It is rooted in our desire for fame and respect. Because we do not have these powers, we assume that those who have them deserve our devotion and respect. We assume that they are spiritually advanced, even though they may be as much a slave to their past conditioning and negative thoughts and emotions as we are. It is like how we think the wealthy deserve respect without questioning how they achieved their wealth. We think to ourselves that once we are able to demonstrate these spiritual powers, we will gain fame and respect. Even highly evolved spiritual beings like Swami Rama and Paramhansa Yogananda were not spared from this desire. In his book, ‘Living with the Himalayan Masters’, Swami Rama told a story that he once met a swami who could shoot fire from his mouth for several feet. Swami Rama thought to himself that this man must definitely be more spiritually advanced that his master. Even the fire-thrower swami said to him, “You are wasting your time and energy staying with your master. Follow me and I will give you some real wisdom. I will show you how to produce fire”. Swami Rama then went to his Master and told him, “I have found someone more advanced than you, I have decided to become his disciple”. The Master replied, “I am delighted. Go ahead, I want you to be happy. What does he do?” Swami Rama told him and his Master requested to meet this fire-thrower swami. They walked for two days to meet the swami. When they arrived, Swami Rama was shocked to see the fire-thrower swami bowing down to his Master. His Master explained, “Of course. He left our monastery some time ago. Now I know where he has been hiding”. At his Master’s request, Swami Rama asked the fire-thrower swami how long it took him to develop this ability. He proudly replied that it took him twenty years of practice to master the ability. The Master then said to Swami Rama, “A match will produce fire in a second; if you wish to spend twenty years to produce fire from your mouth, you are a fool. My child, that is not wisdom”. Swami Rama wrote, “I realised that all such siddhis are but mere signs on the path. These powers have nothing to do with spirituality. I later found out, after experiencing and examining them, that these psychic powers have little value. To the contrary, they can create serious obstacles on the path. Sometimes psychic powers develop: you start telling the fortunes of others, you start knowing things. These are all distractions. Do not allow them to obstruct your path. Too many people, including swamis, have wasted time and energy on such distractions. Anyone who wants to develop siddhis can do so and can demonstrate certain supernatural feats; but enlightenment is an entirely different matter”. Only once did his Master display his power to Swami Rama and that was out of necessity. They were walking in the Himalayas when a huge avalanche happened. They were directly in its path and there was no way of escaping. Swami Rama panicked and prepared himself for death but the Master just calmly put up his hand and the avalanche froze! 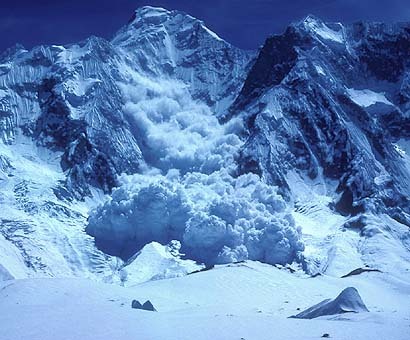 It was only after they have crossed the path of the avalanche that it began to rush down the mountain again. Paramhansa Yogananda’s brother, Sri Sanada Lal Ghosh, wrote about his life with Yogananda in his book ‘Mejda’. He wrote that in his early years, Yogananda often went to the Nimtala cremation grounds to meditate. It is where their mother’s body was cremated after her death. A short while after Yogananda started meditating there, Sanada noted that a matted-haired ascetic, dressed in a dark red cloth, often came home with Yogananda and they would go directly to his attic room. Sanada was afraid of him because his eyes were always red and on his forehead was a long mark of deep vermilion. One day, when the two of them had left the house, Sanada stole up to the meditation room. He gasped when he saw a human skull and two human bones placed crosswise, resting on a wooden stand. The skull has a vermilion mark like the sadhu’s. He ran downstairs and told their father about it. Their father later spoke quietly with Yogananda and explained to him the harm that could come from tantric practices. Thereafter, Yogananda gave up the practice and the saddhu never came to the house again. The famous American Psychic, Sylvia Browne, was born with psychic powers. She is able to communicate with astral beings and to foretell the future. She explained that she is able to use her powers to help others but when she tries to use it for herself, she goes blank. She explained that she must still face life’s challenges and make mistakes. She is also still a slave to her negative thoughts and emotions. Despite her psychic powers, she is still a slave to her mind because she is not yet self-realised. However, she has gained much wisdom through years of helping others with their grief. These examples show how easily we can be tempted by spiritual powers. It is a distraction which confuses us to think that we can only have happiness once we achieve these spiritual powers. We mistakenly believe that the developments of spiritual powers are milestones on our spiritual path. That is incorrect. Real progress is the mastery over our mind. When we overcome the desire for something, that is one milestone. When we gain mastery over our anger, that is another milestone. The development of spiritual powers has little to do with the mastery over our mind and emotions. One may argue that one is able to help others with the spiritual powers. That is true but think how much more benefit we can bring to humanity as a whole when we achieve self-realisation. When one person achieves self-realisation, there is an upward shift in the consciousness of humanity as a whole due to the oneness of all beings. When we use our spiritual powers to help others, we may help a few hundred people or maybe a few thousand. When we achieve self-realisation, we help the entire universe. In addition, one’s assistance to others by using one’s psychic power would only provide a relief for their current problem. Who will help them with their future problems which would inevitably arise? The desire for spiritual power is one of the many desires which we need to transcend in order to let go of our attachment to our physical body. When we develop these powers, let us remind ourselves that these are merely distractions which we should not get attached to. May we stay focused on our path towards self-realisation. What is self-realisation? Can someone tell me? It must be something more than realising that the self is deathless and is a spark of the divine. It is something we realise not only intellectually but also experience. During meditation, we sometimes lose the feeling of the ‘I’. Does self-realisation mean that at all times, we should be in that state? If so, why are we given responsibilities and trapped by Maya? Or are we supposed to carry on living balancing our worldly responsibilities with the realisation that everything is temporary? Is that self-realisation? I am confused. I am not interested in siddhis. Can anyone out there let me experience what great yogis and gurus experienced, please? SIDDHIS,to have it takes a long time,to use it the wrong way you are asking for it.Just have it to experience it; then leave it for higher practises.The power of it may give a glimpse of power. What happens next we don’t know ask a spritual master he may have answers to this; I am not.I feel meeting the MAHA AVATHAR himself is better. Very true but I must confess that I wish for siddhis to cure or help people who are suffering. Another desire to trap me? Not if self-realisation remains as your ultimate goal and you do not allow pride to be your Master. True again. However, I still have not got a clear answer on what actually self-realisation is. And is wanting to help others pride? To understand self-realisation, we need to understand the ‘self’ or ‘ego’. To understand the ego, we need to observe it during our meditations and arrive at the answer to the question ‘Who am I’ as advocated by Ramana Maharshi. Desire to help others is not pride. The desire to be known and respected for helping others arises from pride. But this form of pride is still benefecial to the world as it inspire one to help others. However, a person who wants inner-peace will guard himself even from this form of pride.